Motorola has a new 2D barcode scanner out, the DS4208, and it looks to be an affordable alternative to the high end 2D scanners that have come out in the past year or so. A lot of retailers may want to scan 2D coupons, or maybe read coupons off of cell phones, but can’t justify spending $400+ for such a scanner. Thankfully, this scanner hits a price point that should be a lot more palatable. The scanner comes in three styles, Twilight Black, Cash Register White, and Healthcare White. Twilight Black & Cash Register White are the standard color schemes you see other Motorola hand scanners in, so that’s pretty standard. The healthcare model comes in hospital white and blue, and features the specialized plastic housing that can be cleaned by chemical agents without pitting or becoming brittle. And it matches hospital color schemes. You don’t want to clash at your hospital, that would be far too gauche. Scanning with the DS4208 is pretty snappy, and you get a range of about a quarter inch to over a foot with standard retail barcodes. Performance was pretty similar to the LS2208, with the DS4208 able to read 100 mil reflective barcodes from about 8 feet back. I doubt many people will need this functionality from the DS4208, but it’s there, and that’s pretty rad. A red LED circle is projected before scanning to let you know what is about to be scanned. Aiming assistance is fantastic, and the LED helps especially with closely aligned barcodes. There’s also some pretty legit motion tolerance for the scanner, with an ability to scan barcodes moving up to 100 inches per second, or about 6 mph. So you could catch the barcode on someone going for a light jog, maybe the wristband on a patient making a break for it, or maybe even use it to set split times on slot car racers. Or I guess you could also put it in presentation mode and scan high volumes of groceries & whatnot. That one seems more apt. Motorola built the DS4208 to be pretty resilient, so this scanner could fit in pretty well at garden centers as well as retailers. The body is pretty sturdy and offers a drop resistance of 6-feet to concrete, so even falling off a shelf won’t really cause problems. And an IP43 seal, while not quite as robust & “sneezeproof” as the IP54 of burlier scanners, still keeps out some dirt and water splashes. I wouldn’t hose it down, but collateral damage from a water balloon fight might be okay. And with all this fanciness you get a 5 year warranty. Used to be 2D scanners came with 2 year warranties if you were lucky. Now they’re so near bulletproof that manufacturers will give you another 3. LS4208: Good for higher volume retail. It scans pretty quickly, and is aggressive. It is a little spendy, but it’s going to give you more bang for your buck than the less expensive scanners. 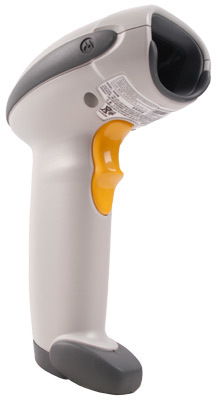 LS4278: The cordless version of the LS4208. It has a 70 foot range and built-in rechargeable battery. It’s not ruggedized, so it’d be better at home in retail environments as opposed to warehouses. All three can shoot a secondary rasterized laser pattern. Rasterization, in POS, is using mirrors to propagate a laser into more places. All laser barcode scanners do this by design, otherwise it’d just be a dot shooting out of the scanner. The secondary one on these barcode scanners gets the beam to wave up and down, helping increase accuracy on crappy barcodes, and gives certain models an easy way to scan PDF417 barcodes, which are 2 dimensional. Yeah, the video’s a little washed out. We’re working on a location that provides more even lighting, while not sounding as echo-y.